Currently, there are about half a million bartenders in the U.S. 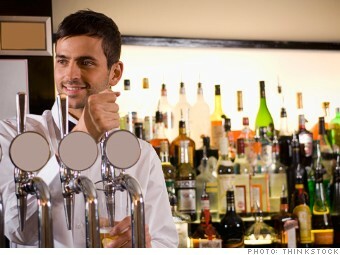 While some are just paying their way through school, others are making mixology their career. Once neophyte bartenders accumulate more experience and skills, they can advance to more upscale establishments and push their incomes well past the overall median. A top earner at an "A-List" restaurant or bar can bring in up to $100,000 a year, including tips, according to Brenda Carter, of UniteHere, a union that represents workers in the hospitality industry.